Reverse Mortgage module is beneficial for lenders who provide these useful mortgage options for seniors. If your mortgage company (or your co-sponsoring Lender's mortgage company) offers reverse mortgages, you may want to reach out to Homebot to have this module "turned on" for your client-base. Many lending companies offer reverse mortgages as a valuable way of enabling your senior citizen clients to finally enjoy the wealth they've worked so hard to build. The new Reverse Mortgage module is not turned on automatically for your account. It must be turned "on" by Homebot and is turned on at the brand (company) level. 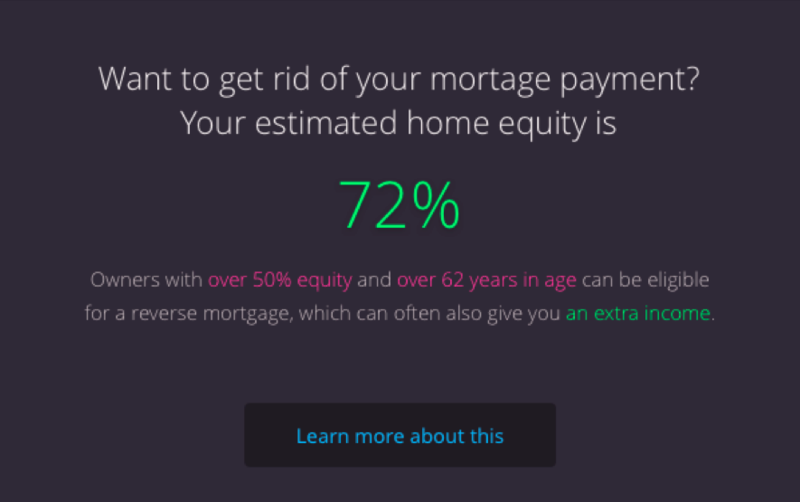 Once activated, this module delivers important and valuable Reverse Mortgage insights (see image below) to your clients who are at or close to the qualifying age (61.5 years old, in most cases) and who have at least 50% equity. Reverse Mortgage insights are (mostly) relevant to your clients who are near the qualification age. But here's the trick... we can do this using the date-of-birth (DOB) information many of you provide during a bulk data import. But here's the rub... we often don't get the DOB data from you and we don't currently have a way to enter it through the user interface (when adding new or editing existing client profiles). But, we're working on it! Stay tuned as we give you this ability. But, if you have bulk imports of clients you'd like us to load, be sure to include the DOB information to take advantage of this and other up-coming new features and content. Want to turn "On" Reverse Mortgage content for your clients? No problem. It's easy. Just reply to this email to let us know and we'll reach out to you or give us a call.